This might sound a little harsh to some, but to most small business owners and operators I know, it rings true—it represents the way we live. Failure is factored in every time we calculate a risk, so it’s just part of the assessment. And if an effort doesn’t succeed, it becomes another learning experience to move on smarter and be more efficient next time. Failure becomes much less painful if it’s used as a tool to grow and maintain a successful business. It becomes a corridor for SMBs to achieve their goals. What is it about us SMB owners? But of the hundreds of SMBs I have worked with over the years, I have only been able to find one universal thread among their owners and operators—at least the successful ones. There are many words to describe this shared trait: resolve, persistence, determination, and my personal favorite, tenacity. Many people don’t even realize how tenacious they are, because they don’t recognize that they have done things that tested their inner strengths. But for those of you who have fallen down, picked yourself up, and gone on more determined than ever, there is no question—you have this quality in spades. And read on, because you are in excellent company. There’s not much debate as to whether successful people all over the world have endured spectacular failures as they navigated toward their destinations of success. Although many of their names are recognizable, their ability to conquer fear and maneuver through their own setbacks is not quite as publicized as their accomplishments. They all seemed able to pick themselves back up and use their failures as an epiphany on how to do it better the next time around. This brief narrative chronicles the founder of KFC, the legendary Colonel Harland Sanders. The Colonel was a starry-eyed 65 years old, armed only with a $105 social security check and his now-celebrated fried chicken recipe, when he started KFC. He went on to become a billionaire by age 88. There are many chapters to his success story, and they are riddled with impediments and failures. So, you get the idea, right? As an SMB owner, if you give up on your hopes and dreams, so will everyone else. And that is the true definition of failure: the failure to try. Here are some more examples, but please bear in mind it was not my intention to include a lot of detail here. Please note: Writing about the setbacks these paragons endured, or about anybody’s failure for that matter, is not meant to cast blame or indicate who is responsible. Failure is typically the result of multiple factors, and often the cause is out of the control of those most affected by it. ✅ Henry Ford: He failed five times and was financially broke before he founded Ford Motor Company. ✅ R. H. Macy: The founder of the famous department store chain started seven failed business before finally succeeding with his first store in New York City. ✅ Soichiro Honda: Honda was turned down by Toyota Motor Corporation after interviewing for a job as an engineer. Out of work for an extended period, he started making scooters out of his home. ✅ Akio Morita: Morita founded Sony. His first product was a rice cooker that didn’t cook rice so much as it burned it, selling less than 100 units. This hindrance didn’t stop Morita and his partners as they pushed forward to create a multi-billion-dollar company. ✅ Bill Gates: Gates dropped out of Harvard and started a first (failed) business called Traf-O-Data with Microsoft cofounder Paul Allen. That didn’t stop him from creating the global empire that is Microsoft. ✅ Harland David Sanders: Better known as Colonel Sanders, his famous secret chicken recipe was rejected 1,009 times before a restaurant accepted it. ✅ Walt Disney: He was fired by a newspaper editor because his supervisor claimed he “lacked imagination and had no good ideas.” He started a number of businesses that ended with bankruptcy and failure. ✅ Thomas Edison: The very definition of “persistence pays,” he was told by his elementary school teachers that he was “too stupid to learn anything.” He was fired from his first two jobs for not being productive. Edison made thousands of unsuccessful attempts before inventing the light bulb. ✅ Orville and Wilbur Wright: It took many years of hard work and tons of failed prototypes before the brothers finally created a plane that could get airborne and stay there. ✅ Howard Schultz: Schultz opened his own coffee bar, naming it Il Giornale, Italian for “The Newspaper.” After two years of great success with his coffee shop, he set out to buy Starbucks. While raising the capital he needed to purchase the company, Schultz was turned down by 217 of the 242 investors he initially talked to. ✅ James Dyson: Dyson made nearly 4,000 prototypes of his vacuum cleaner and had to be supported by his wife’s income from giving art lessons. There were many tough times for the Dysons, but each failure brought them closer to creating a revolutionary machine. Initially, Dyson could not convince any of the major retailers to sell his finished prototype, because the vacuum bag industry was so large that the retailers were afraid to irritate them. Even that did not stop Dyson. He created his namesake company, Dyson, Inc., in 1993. He was 46 years old at the time. Please post them in the comments section! Besides that, I'm inviting all of you to tell us about your own experiences with initial flops. Now, my early experiences pale in comparison to the people I listed above, but since this is about SMB owners, and I am one of them, I feel I should disclose a few of my own tribulations. Before you read about them, I should clarify that the experiences I describe here are only a synopsis of what I actually went through. Most of my failures took place at MTI, the parent company of DocuSend. In fact, the DocuSend cloud-based mailroom was born out of those setbacks. What is not included in this article are the contributions of the amazingly talented people who poured their hearts into MTI and the cloud-based service that resulted in the birth of DocuSend. Why are they left out? 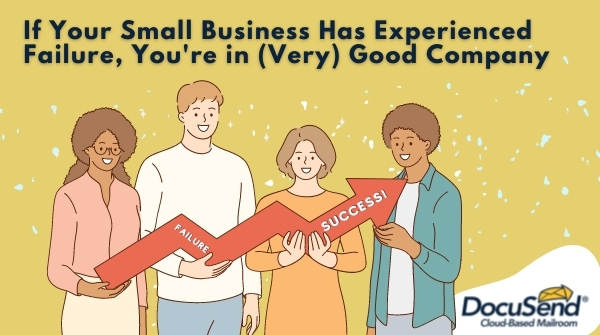 Because this article is not about them, or me for that matter; it is about how small business people like us can use failure as a pathway to success. However, you will read about our team in future posts, and I think you’ll agree how amazing they are. MTI was bootstrapped with almost zero capital. I lost money in my first year in business. Professionally, it was the scariest thing I had ever done. Looking back at it now, it seemed like the people that supported the startup had more faith in me than I had in myself. It took nearly 11 months before I landed my first statement processing contract. And we still service that contract today. It took thousands of letters, faxes (the internet did not exist) and phone calls to even begin to build some momentum. Keep in mind that MTI’s process required our clients to share extremely sensitive data just for basic services. In the beginning, the question I most dreaded from a potential client was: “Who are your other clients, and how long have you provided document rendering services for them?” I tried to convince them that my expertise and commitment far outweighed my client base. Sometimes it worked, and sometimes it (everybody all together now) failed! And then “The Age of Acquisitions and Mergers” hit. Some of our larger contractual clients were either acquired, merged, consolidated or regionalized. In most cases, agreements simply expired and went to a larger service provider than me. But a couple of contracts were breached. May, 2009: 15-year statement processing contract with a large cable company representing 40% of MTI’s volume lost due to corporate regionalization. October, 2009: Marketing agreement representing 21% of MTI’s volume lost due to corporate regionalization. June, 2010: 9-year statement processing contract with an energy service company (ESCO) representing 15% of MTI’s volume lost due to acquisition by a Canadian firm. August, 2010: 4-year statement processing contract with an ESCO representing 32% of MTI’s volume lost due to acquisition by a Canadian firm. September, 2014: 5-year statement processing contract with a billing software provider representing 9% of MTI’s volume lost due to a merger with a Spanish firm. October, 2014: 11-year statement processing contract with a utility company representing 9% of MTI’s volume lost due to an acquisition/merger with an American and Canadian firm. Those failures directly resulted in the birth of DocuSend! All our clients were large enough to avoid the transactional costs associated with low-volume and high-frequency document distribution, but SMBs were underserved in the print-to-mail arena. It took three years to develop, but DocuSend eliminates the exchange of data in multiple formats by replacing it with standard PDF images. So, we can provide print-to-mail services to the millions of small businesses across the US, Canada and the entire world. It’s the same concept as payroll service providers, except it addresses accounts receivable. We were working on developing DocuSend before we lost all those contracts, although it was still in the conceptual stages. You see, those failures had taught us that even if you’re on the right track, you’ll still get hit by a train if you don’t move. From major fiascos to minor snafus, we can all learn valuable lessons from each other’s experiences. Have any hard-earned wisdom you’d like to share with your fellow SMB owners and operators? Please post it in the comments section below.